The Constitution permits Congress to authorize the use of the militia “to execute the Laws of the Union, suppress Insurrections and repel Invasions.” And it guarantees the states protection against invasion or usurpation of their “republican form of government,” and, upon the request of the state legislature, against “domestic violence.” These constitutional provisions are reflected in the Insurrection Acts, which have been invoked numerous times both before and after passage of the Posse Comitatus Act, 18 U.S.C. Section 1385, in 1878. Congress has also enacted a number of statutes that authorize the use of land and naval forces to execute their objective. The act is not violated when the Armed Forces conduct activities for a military purpose. The language of the act mentions only the Army and the Air Force, but it is applicable to the Navy and Marines by virtue of administrative action and commands of other laws. The law enforcement functions of the Coast Guard have been expressly authorized by act of Congress and consequently cannot be said to be contrary to the act. The act has been applied to the National Guard when it is in federal service, to civilian employees of the Armed Forces, and to off-duty military personnel. The act probably only applies within the geographical confines of the United States, but supplemental provisions of 10 U.S.C. §§ 271-284 appear to apply worldwide. Finally, the act is a criminal statute under which there has been but a handful of known prosecutions. Although violations will on rare occasions result in the exclusion of evidence, the dismissal of criminal charges, or a civil cause of action, as a practical matter compliance is ordinarily the result of military self-restraint. 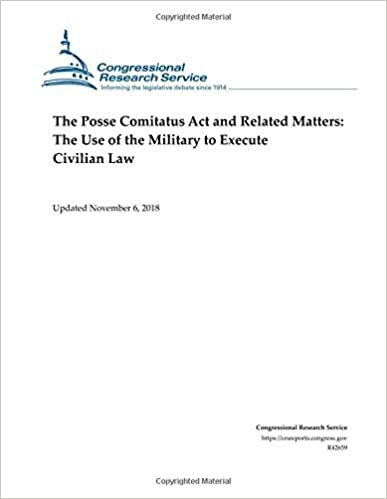 This report provides an historical analysis of the use of the Armed Forces to execute domestic law and of the Posse Comitatus Act, including their apparent theoretical and constitutional underpinnings. The report then outlines the current application of the act as well as its statutory exceptions, and reviews the consequences of its violation.